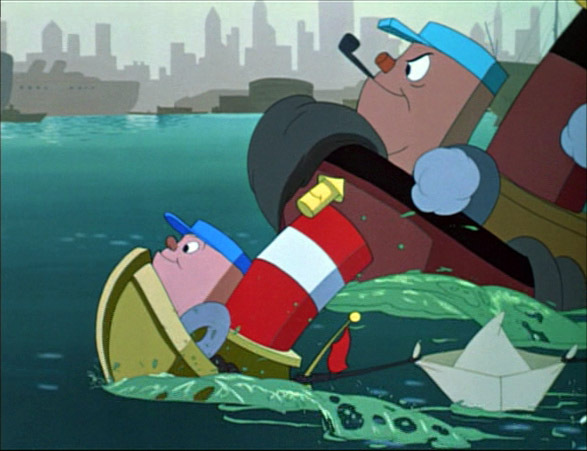 In ‘Little Toot’ the Andrews Sisters sing the story of the humanized tugboat Little Toot who’s expelled first, but who becomes a hero by saving an ocean liner from a terrible storm. This storm, which contains some very spectacular animation of water, is the most interesting part of this otherwise dull and sugary story. ‘Little Toot’ is very similar to ‘Pedro the airplane’ sequence from ‘Saludos Amigos‘ (1942), but much less successful.